Home > Shop By Brand > BLACKFIRE Pro Detailers Choice Car Care Products > BLACKFIRE Microfiber Cleaner & Restorer 128 oz. Restore your microfiber with every wash! If you use microfiber towels to detail, you know it's not like any other fabric. Microfiber is engineered from manmade fibers to be softer, more durable, and more absorbent than any natural material. Many microfiber towels and tools have a static charge that attracts dust and lint to make cleaning easier. Cotton can't do that! Because of all these special features, microfiber has some special cleaning requirements. BLACKFIRE Microfiber Cleaner & Restorer removes oil, grease, wax and polish residue, protein-based stains like blood and sweat, grass stains, food, and cosmetics! Mild water softeners in BLACKFIRE Microfiber Cleaner & Restorer neutralize hard water in the washing machine to maintain the softness of microfiber. No additional softeners or dryer sheets are needed. Microfiber products will come out of the dryer feeling soft and fluffy. Most importantly, microfiber will retain its cleaning properties wash after wash.
BLACKFIRE Microfiber Cleaner & Restorer rinses clean and leaves no residue or scent behind. Our VOC compliant formula is biodegradable and safe on all fabrics. In fact, you can use BLACKFIRE Microfiber Cleaner & Restorer to clean terry cloth and leather chamois. Microfiber is unlike any other fabric and it deserves a cleaner unlike any other detergent! BLACKFIRE Microfiber Cleaner & Restorer releases tough stains and residues while restoring the softness and cleaning ability that makes microfiber the best detailing material. Removes wax and polish residue from microfiber. Removes grease, grass stains, make-up, food, oil, and protein-based stains. Contains no fabric softener or bleach. Restores like-new texture and softness. Always wash microfiber separately from other laundry. Do not use fabric softener, bleach, or dryer sheets. 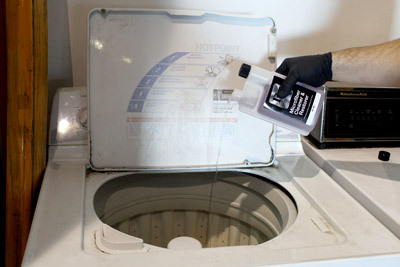 Add 2 ounces to washing machine to clean a half load of microfiber. Add 4 ounces to clean a full load. Tumble dry microfiber on low heat or no heat. Wolfgang Microfiber Cleaner and Rejuvenator 128 oz. Made all of my used micro-fiber towels like new again. Tough on stains, yet leaves your micro-fiber towels soft and plush. CLEANS BETTER THEN ANY OTHER MICROFIBER CLEANER OUT THERE. I bought this stuff a year ago after reading so many good reviews. background: I have owned a very busy detail shop and car lot for many years and have used cheap $5 a gallon dollar store detergent for years. heard the reviews, saw it on sale, tried it, and after 1 load was done. not as good as soap. not worth more than $3 a gallon. and its $45 a gallon. towels were not softer or cleaner. I just don't get all the hype. I really don't.